This topic may or may not belong to this blog, but it definitely deserves a comment! 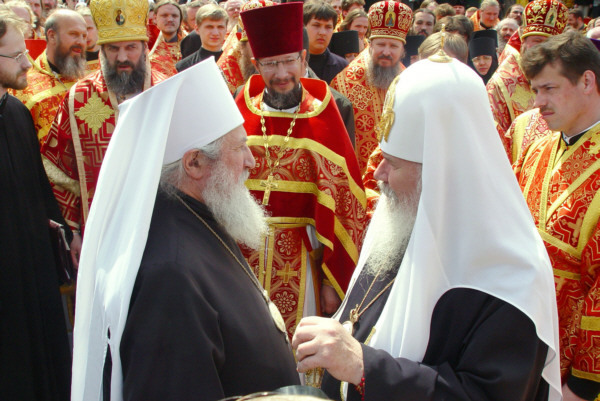 The Russian Orthodox Church Outside Russia (ROCOR) has returned into communion with the Moscow Patriarchate after 79 years! Yes rejoice as we join the hand of the WCC. Lets pray with wiccans and buddists. You foolish bishops. I have not an ounce of respect for your blind mistake. You have now polluted the souls of thousands (which include MY CHILDREN) so that you could have your names written in history. Please see your mistake! I beg of you! Whats next, the pope? Most likely, since our new MP has had many public meetings with him. What I say is not because I feel I am a holy man, but rather being such a wrecthed sinner myself, it is easier to see other peoples deceit.